Let’s play some of our favorite 3D video games and see what it looks like powered by Retro//VR! SEE (IN 2D) FOR YOURSELF! For the price of a few full body transplants, you can own this sleek, stylish, and if I might add, quite attractive looking VR helmet for home and public use. Toggle on the Augmented Retro-Reality mode and see what your friends would look like if they were 8-bit. ** In-game versions of the VR helmet allow your character to see and experience the game world in 2D if you are in 3D, or in 3D if you are in 2D. But just your character. Not you. Would you look at that!? Imagine the infinite possibilities of what could happen when you try it with your favorite games! Like AdventureQuest 3D or AdventureQuest 3D. It is fast, easy, and fun! Be sure your home computer has high enough hardware to support the massive computational power required to convert 3D games into 2D in REAL TIME! ...and that future, is weee bit more 2D than expected. RetroVR may cause nausea, headaches, poor google search results, food to taste like certain colors, your tooth enamel may become sentient as the wireless AI interfaces with your body at a cellular level, relationship problems, toe enlargement, extreme need to use the restroom during dragon raids, 8-bit hallucinations, sweating, sweatering, sweetening, brain compression, DPS increase, increased attractiveness to people you already find attractive, interventions from friends, parents, and loss of job. If your video gaming lasts longer than 48 hours, please contact a doctor immediately-- or acknowledge that you may be trapped in a Sword Art Online or Dot-Hack scenario, in which case, let us all pray you are the main character and not a fodder worthy side-character who is doomed to not make it past episode 2. Show us YOUR best moments converting 3D games to 2D. Use the template below. Tag your images on social media with #RetroVR so we can see and show them with other gaming fans! To find out if Retro//VR is right for you, visit www.AQ3D.com and www.AQ.com. Launches April 1st! The Elemental Avatars control the hidden forces of Lore. But sometimes, to truly change the world, an Elemental Avatar needs more than their Champion, Dragon, and Titan. Starting tonight, help a young hero discover his identity… and destiny! Begin the adventure when you /join iceplane and battle alongside Abel (who many of you will remember from the Cryostorm zone) as he discovers his TRUE destiny... and becomes the very cool dude he was always fated to be! The seasonal farming quests and drops have been removed, but will be added back once Frostval returns! 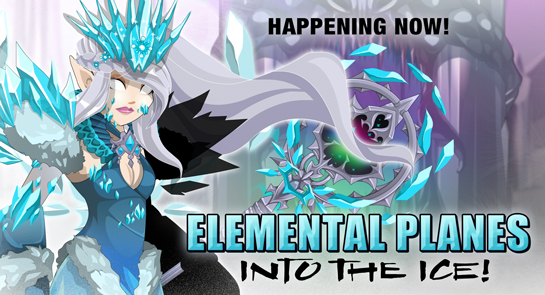 Battle to unlock the pieces of the IceBreaker Mage set on the left from the monsters in this week's story release. 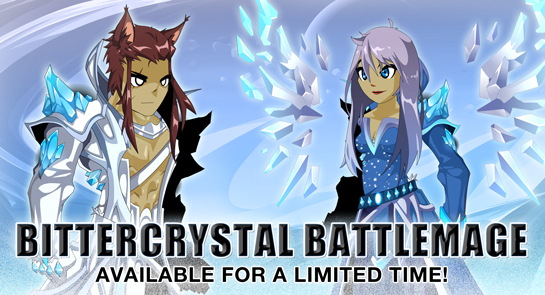 And chill out after battle with the BitterCrystal Mage Robes and Wings, available from the March Featured Rares shop! EpicDuel's coolest blades are here! 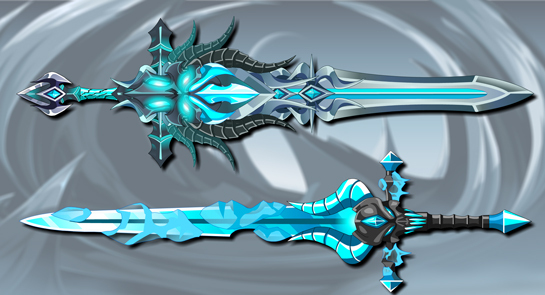 The EpicDuel team has graciously allowed us to use the art from their Frostbane and FrostSlayer blades! We're Not Ignoring You (unless you're just looking for attention)! Artix Entertainment tries to set it self apart from other game companies in a lot of ways but one of the most important is how much we interact with you guys. Any of you who follow my Twitter or like our AQW AQW Facebook Page know this to be true. We love talking to you and even when we don't love what we hear, we love that you care enough to tell us what you don't like and we try and fix it. Unfortunately, we are not always logged in to Twitter (we do sleep on occasion) and when we are, we all have a LOT of people talking to us (at this time I have 91,000 Twitter followers and Artix has ove 134,000!) so If we don't reply to you it's probably because we either missed your Tweet or because we can't reply to every single Tweet. Another thing to mention is that, even though Devs, Mods, and Testers are on twitter, they cannot help you with account issues. Devs (or Game Developers) are the people who spend all week building each new release for you to play, and fixing the bugs that you have reported on the BUG Tracker. We also have a lot of other jobs dealing with game development and community outreach. All that stuff takes up the entire week (which is why some releases come to you a little later than others) and our jobs don't leave time for much else. In the rare cases when we DO find ourselves with extra time, we make side releases, contests, or work ahead on new game ideas! So you can see we Developers keep pretty busy with our own stuff. That's why we have Moderators to help you and protect you in-game and Player Support to help you outside the game with account and payment issues. Nythera, Neveya, Vidra, & Lady Tomo make up the Player Support team. Their primary job is taking care of you and your account issues. They do a fantastic job and are often overlooked for all the effort that they put into making AE function. These are the brave and tireless people who read all of your HELP MAIL so you should always GO HERE if you've been hacked or find yourself with a payment issue. The Player Support team receives THOUSANDS of e-mails EVERY DAY and they read every single one of them, but with so much to do, they can get a little behind sometimes and can't reply to you instantly so if you have a problem, please be patient. Sora to Hoshi and her team of Moderators handle a lot of in-game issues. Everytime someone is using foul language or trying to scam or trade accounts, it is THESE heroes to quietly step in and take action to try and keep the game as fun as safe as they can, and many of these mods are volunteers. They are giving their own time to sort through reports for no reason other than they really CARE about making AQW a safe and fun place for everyone, but they need YOUR help. 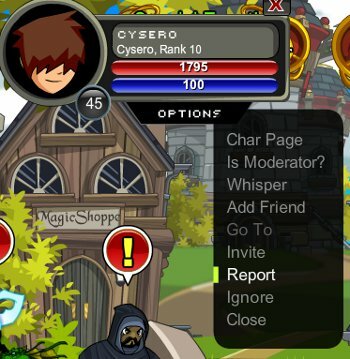 If you see someone that they shouldn't be, click on their portrait and use the REPORT function to bring them to the attention of the Mods! Reens, Cemaros, and their game/bug testers aren't responsible for any in-game moderation. Reens' game testers look at the releases before they go out to help catch bugs before you guys do. Cemaros' bug testers check on the bug reports you send in to the Bug Tracker. They spend their own free time trying to help make AQWorlds a better, more fun game for everyone! A Dev's Job is making the games. Player Support's job is taking care of account and payment issues. Moderators handle mutes and bans of in-game rule breakers. Testers check on the releases beforehand and confirm your bug reports after you send them in. Each team has their hands full. That is why Devs can't help you with your account or payment issues when you ask for help over Twitter. It's not because we don't want to, it's because it's not what we do and we literally CAN'T help you in most cases. Telling the us DEV's over Twitter about your account issues is just about as useful as telling a bowl of soup to fix your broken TV. It's the same reason that Doctors don't put out fires, Firefighters don't pick up your garbage and Waste Workers don't do open heart surgery. They each have their own job that keeps them quite busy. If you are having account or payment issues the best thing you can do is head to the HELP PAGE and if you ask us for help over Twitter, that is why we direct you there instead of fixing your account. I DON'T WANT TO GET HACKED! If you don't want to lose your account there are 5 simple things that you should do. Pick a VERY GOOD PASSWORD. Make it hard to guess, use letters AND numbers. Avoid simple or passwords like AAAAAAA, qwerty, asdasdasd, 12345, 54321, or your character's name. Never share your account with anyone (even your siblings or best friend). Never tell anyone your password, no matter who they say they are or what they promise you. There are TONS of fake Cyseros, Alinas, Artixs and other AE fake AE staff ALL OVER Facebook and Twitter. AE STAFF WILL NEVER ASK FOR YOUR PASSWORD. We don't need your password. We have access to all of your accounts right now. Hook your AQW account up to your BATTLEON PORTAL account! If something ever does happen, it's an extra level of security and helps Player Support fix your up faster. Never use Hacks, Cheats or Bots. Many of these programs will secretly install a trojan virus called a KEYSTROKE LOGGER on your computer. This virus records everything that you type (passwords, credit card info, which websites you visit) and sends the information back to the creators. Thanks to Cysero for the original post, which has been updated. It is with deep sadness that I write to tell you that during the night, the real life Daimyo, my faithful companion of over 15 years, has left our world. The veterinarian said that his heart was just too big… which was true both figuratively and literally. If you did not know, he was with me when I wrote the first line of code for the original AdventureQuest. 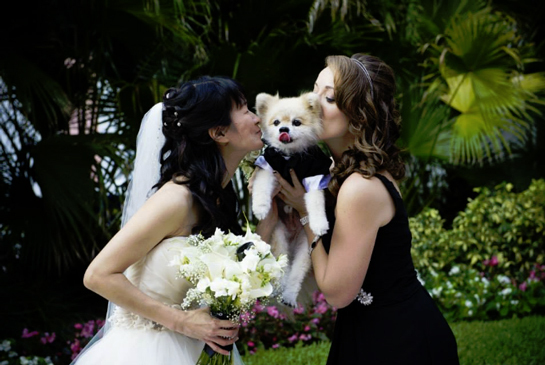 He was the inspiration for Daimyo, the Undead Slaying Pomeranian, who appears in many of our video games-- where he will live on forever, as an iconic symbol of hope, loyalty, and cuteness. It is our tradition, that every year on Daimyo’s birthday, we release a different version of him as an in-game pet. This year, on his birthday of June 1st, we will do something special. If you would like to show your respect to the real life version of this legendary video gaming puppy, you can like this Facebook post, or favorite this Twitter post. 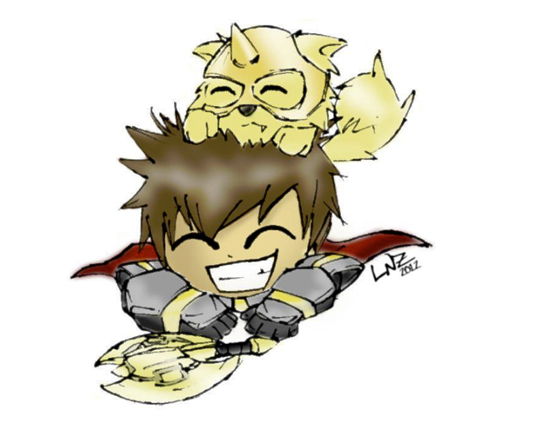 If you would like to share any fan art of Daimyo, please post it to those links. This is the only time I have ever cried writing a design notes post. Much love to you all. Will YOU ally with Chaos? It is said that "the enemy of my enemy is my friend" -- and in this case, that is VERY true! On Friday, March 24th, journey to Crownsreach and talk to Drakath - the former Champion of Chaos. He is plotting his return to power after the Queen of Monsters stripped it from him... and humiliated him in front of the entire world. Rank up your Chaos Faction rep to unlock new gear from Cemaros, check out Gesar's gear shop, and do NOT poke your fingers into the cages in Skoa's Chaotic Critter cave. Since AQWorlds began, we've had heroes asking for the ability to choose a Chaos Alignment, just like you can choose Good or Evil. Chaotic Good, Neutral, and Evil heroes... your TIME is almost here! Talk to Cemaros to choose a Chaos Alignment. You'll need the Chaos Contract (sold for 100,000 gold). Once you choose this, your character page will change to show the Chaos Hero alignment. If you are TRULY dedicated - and have rank 10 Chaos rep - YOU can begin Iaste's quests to rank up your Crownsreach Militia faction. 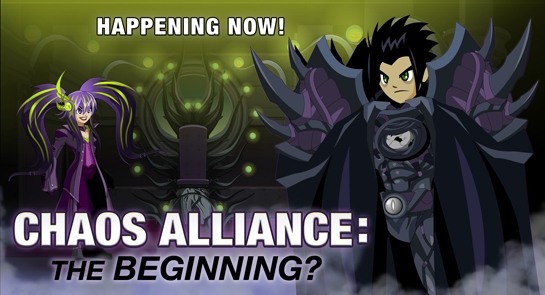 Those who do will become Drakath's MOST dedicated, and trusted, battle companions. New Forums Help For Portuguese Speakers! Greetings! 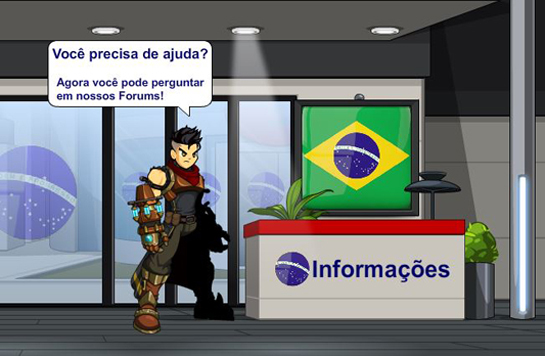 Starting today, we are launching a new program for Portuguese speaking players to get basic help on the AQW Forums. No more hoping Google Translate got it right! Now you can ask and be answered in Portuguese. Anything that cannot be resolved on the forums will still be directed to file a bug report with the Bug Tracker. Nova ajuda nos Forums para fluentes em Português! Saudações! Começando hoje, nós estamos lançando um novo programa para jogadores que falam Português para obterem ajuda no AQW Forums. Sem mais esperanças que o Google Tradutor tenha pego de forma correta! De agora em diante, você pode perguntar e ser respondido em Português. Unlocks the exclusive DragonKnight set inside AQWorlds! The new BattleGems update on iOS rolls out Monday (Apple app store approval is IN)! This is the very last chance for iOS players to get Founder in BattleGems, our mobile RPG Puzzle Game. * Considering that you had.. oh wow, almost two and a half years, it is finally time to make BattleGems Founder go perma rare! For REAL! Along with this release, we will be removing the Founder package which basically gives you ulimited turns, unlimited keys, special in game armor set, special AQWorlds armor set, well... EVERYTHING for a single in-app purchase of $10. Founders will be pretty proud of that they got it, because after the new patch goes live, the armor will be permanent! Replacing Founder is... the Ultimate DragonSlayer Set! 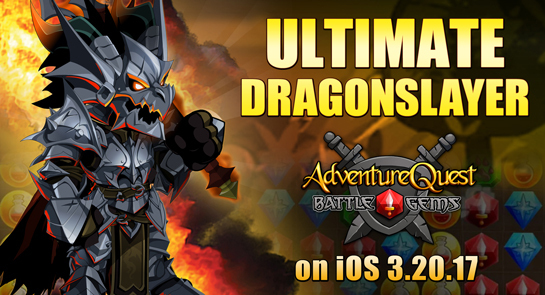 BattleGems Founders automatically unlock the Ultimate DragonSlayer gear! Do ya feel lucky, Hero? The luckiest day of the year is rapidly approaching, and so is Galanoth’s birthday! This Friday, log in to play through the Lucky Day Carnival and talk to Potsy McNobbin to complete his all-new Potchapon reward quests! The Lucky Day Shamrock Fair rolls back into town, too, with all your favorite seasonal gear. Get your Golden Tickets and test your luck with our mini-games, then /join luckdragon to help Galanoth get ALL the luck during his birthday Dragon Hunt! Talk to Potsy in /luck. 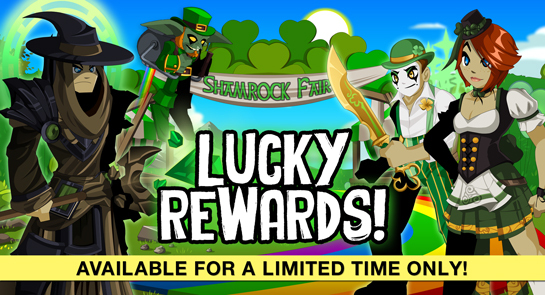 Battle his Pot o' Gold for a chance to get Bronze, Gold, Platinum, or Rainbow coins. Turn those coins in for a chance to get ALL the 0AC rewards below! 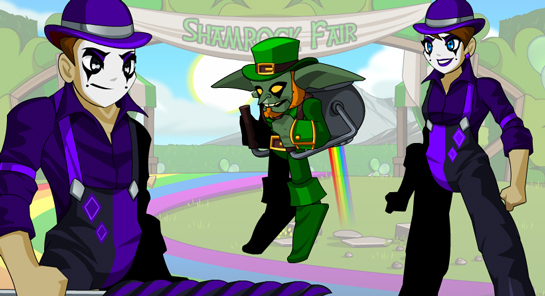 The Dark Mime and Clovercraft Bank Pet are also in the Featured March Gear shop until April 7th! Once a year the Shamrock Fair comes to town with it's games of chance. Here's hoping the luck of the Mog-lish bring you treasures of chance. Also Roy G. Biv needs help saving the colors, so /equip your rainbow and fight Monochrome! What do to: Monochrome has blasted the Rainbow, help the Faeries make everything right. What to do: Play games and earn Golden Tickets for prizes! A-MAZE-ing Race: Find the Small Pot O’ Gold in the Hedge Maze and get the Pot O’ Gold Polish from Monochrome. Jackpot o' Gold: Step up and test your strength! When the pointer is in the red zone click the button for a strong smash and earn Golden Tickets. Rainbow Run: Grab that gold! Collect as many coins as you can without falling or tripping. Speed the Sneevil up by moving your mouse to the right. Slow down by moving your mouse to the left. Jump over holes and obstacles by clicking the left mouse button. Ring Toss: Ring ring! Want Golden Tickets? Just get as many rings onto the bottles with 10 chances. Choose which bottle you want the ring to be on with the pointer then hold down the mouse button. The higher the red in the bar gets the farther the ring goes. Smack A Sneevil: Frustrated at Sneevil’s for taking your boxes? Well let it out by using the mallet to whack as many as you can in the time allowed. 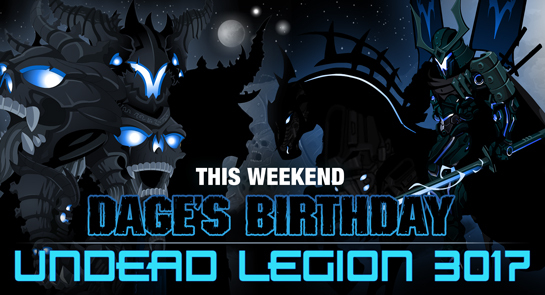 Dage's birthday event continues as we head to WAR! The battle to control the future rages on as Dage the Evil fights his most dangerous enemy! Help him survive the war as we battle aboard the Dreadnaut! Get previews and discuss the event with your friends on its Facebook page! Spoilers! Every birthday needs to have a bit of mystery! Find the mysterious rare set for AdventureCoins once the war boss is unlocked! Note: the quest from the Shogun Paragon pet will be reviewed once we have enough feedback from you guys. If necessary, changes will be made next week. "Wait... what just happened?" you ask? I'll tell you! We've been planning a fun surprise for heroes who upgrade in AQWorlds and managed to keep it a secret! This morning, we gathered up a list of everyone who bought an upgrade in February -- both AdventureCoins and Memberships -- and chose one lucky person from among them to win a custom weapon. That winner is... Zay_M8! We had big plans to put together a video letting him know, and posting it on the Design Notes, but when I went to check out his account, I saw he was online. It is always more fun to give people good news "in person," so I hopped on and talked with him then and there. After being pretty surprised, he got down to business, and described his new custom weapon... and told me the name of two friends he'd like to share his prize with. 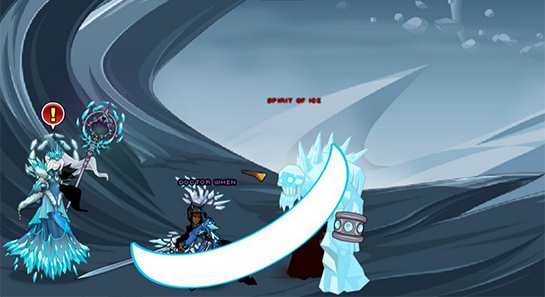 One of the AQW artists will build that blade on Monday, and Zay_M8 and his friends will get it with Friday's release! Good question! Short answer, yes! During the first week of April, we'll choose one person from among a list of people who upgrade in March to get their very own custom weapon (with the option of sharing it with up to 10 friends). Keep an eye on the Design Notes to see if this fun surprise will continue after that! Some of you are asking: "why didn't you announce this before?" Answer: because it's more fun to announce new ways to get rewards when we already have the name of the first winner. I love happy surprises where you guys get cool stuff! SURPRISE! In the future... EVIL has taken over! 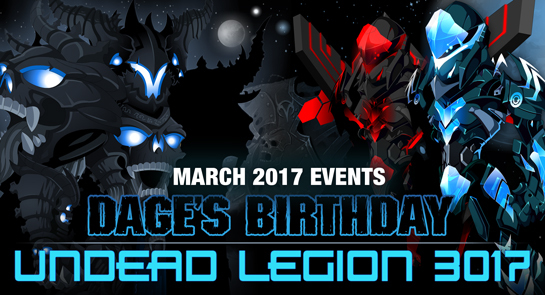 Dage the Evil’s all-new birthday event - Undead Legion 3017 - starts this Friday, March 3rd, as he faces his deadliest enemy… in the future! All the returning seasonal birthday event maps and gear arrive this Thursday, March 2nd! Get previews and discuss the event with your friends on its Facebook page! 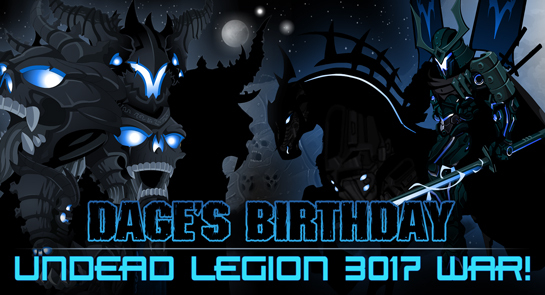 Dage the Evil is being kinder than ever this year! (Hey, everyone gets to be nice on their birthday, right?) Starting this Friday, you'll be able to fill your inventories with a bounty of birthday gear! PS: All the farming rewards this week are 0AC... enjoy the free storage! PPS: We will be reviewing feedback on the Paragon Pet quests over the course of this weekend. Based on player feedback, they may be rebalanced early next week. Starting this Friday at 6PM EST, the March Upgrade bonus sets arrive (replacing February's Blood Samurai gear). 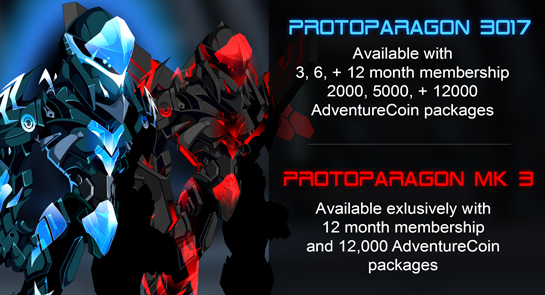 Unlock both the ProtoParagon 3017 and ProtoParagon Mk 3 sets with a 12 month or 12,000 AdventureCoin package or get the ProtoParagon 3017 set with the packages listed below! Dark, Chaotic, and COOL releases ahead! It's your lucky month, Heroes! Get ready to March into battle this month, because war, Chaos, and a very cool adventure are coming your way. Read on and mark your calendars so you don't miss a thing. March 3 - 5th: Dark Birthday Server Boosts! Get 15% more CP and Gold! 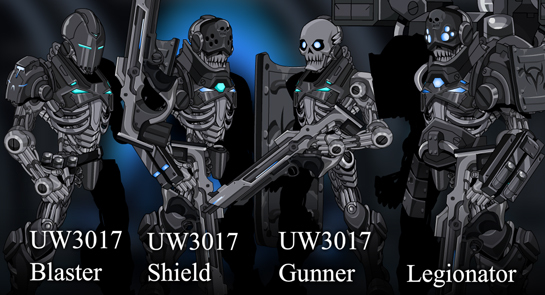 Friday, Mar 10th: The Undead Legion 3017 WAR begins... how will you end it? 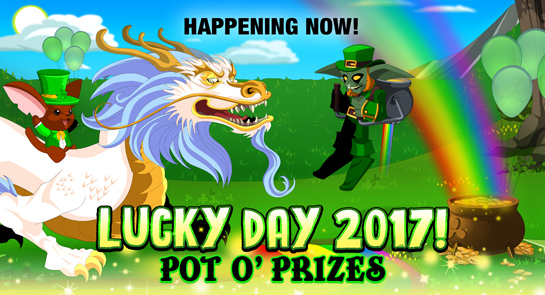 Friday, Mar 17th: Lucky Day returns with your favorite minigames + new gear! Mar 24 - 26th: Weekend of Chaos! Get 15% more Rep and XP! Friday, Mar 31st: Battle through the Plane of Ice with Abel! Member Only Preview/Test Starts Now! This Friday, we will launch an update to one of the most popular classes around, the Legion DoomKnight! We're updating the class now to coincide with Dage's birthday, plus we want to make sure it stays as strong and competitive on the new server as it is in the current one. If you have an upgraded account, you can try out the skills RIGHT NOW and let Arklen (our lead class designer) know what you think! The skills may change based on player feedback... so if you want to have a hand in fine-tuning our newest class, now's your chance! This is the "test" version of the new Legion DoomKnight class so you can try the changes/rebalance out in advance and let us know your thoughts on the skills. Once the class is ready to go live, its skills and art will change to those of the Warrior Class. You can keep the "test" version with the Warrior class skills/art as a souvenir of your participation in the test. The item's name will stay the same: "Legion DoomKnight Tester"
Once the class does go live, it will be available to ALL players! 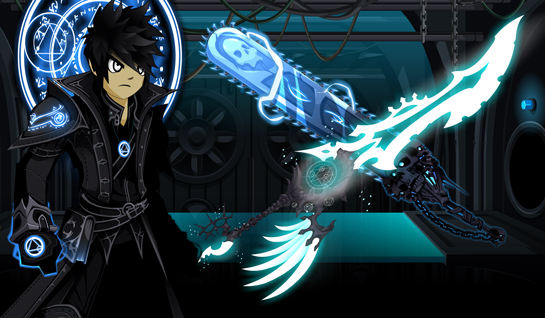 Farm for the Class if you are a member of the Undead Legion by killing Dark Sepulchure. Merge 13 "Sepulchure's Legion Badge" items with 2000 Legion Tokens to create the Class. If you already have the Legion DoomKnight Class, on Friday you'll unlock THIS version for free! Right NOW, though, members can find the class in their game menu and get it for just 10000 gold. Huge thanks to Arklen and the class balance team for their work! Class Skills: Subject to change! To see what the original skills looked like, check out this Design Notes post! Design Goals: The general idea here is to reduce the burst potential of the Legion Doomknight while improving upon its long term fight capabilities, especially when it comes to damage. We are moving away from Luck being the primary enhancement for all classes to add more diversity to your enhancement pool. Fighter and Hybrid will provide you with the resilience you need to compensate for the weaker heal. The improved maximum stack on Touch of Doom is a huge damage boost from the Classic Legion Doomknight so longer fights should end sooner. You’ve seen this before on many classes. It needs no further explanation. Changes: Touch of Doom has been changed to stack to 15. Touch of Death and Doom have been lowered to 3% per stack. At first, this buff is not as strong. BUT as you get closer to 15 stacks though, it will dramatically outpace its old damage. Changes: Soul Siphon cooldown has been lowered to 5 seconds from 6 seconds and the heal is based on current health instead of Attack Damage. The heal is lowered overall but you’ll be able to spam it more frequently. Changes: Legion Dark Blast Torment and Shadow Step aura has been increased to 5 seconds from 4 seconds. Changes: Dage’s Favor has been changed from 20% Increased Damage to 10% Increased Damage and Haste. Changes: Imminent Doom has been lowered compared to the original's DoT, but lasts for 15 seconds now. Damage on hit slightly lowered to compensate DoT damage boost from Touch of Doom buff. Changes: Doom Armor has been changed from 10% Damage Resistance to 8% Damage Resistance and 8% Endurance. Again, these skills MAY change... that will be based on your feedback and what our designers see while you test.